Glyphosate is a herbicide, in other words, it is toxic to plants. 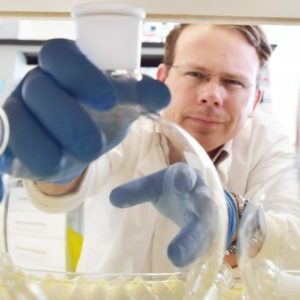 Its target enzyme is not found in insects or other animals, so it is generally not very harmful to them – and as confirmed by a recent study, even direct sprays are not lethal to bees. This is what I said about bees in my series 17 Questions about Glyphosate. I thought that glyphosate having anything to do with bee welfare would be such a far-fetched idea that I needn’t dedicate more time to that. But, time and again, when discussing glyphosate – usually in some completely different context – someone will pop up and go “it should be banned because it harms bees!” So let’s talk about that in more detail. I often try politely to inform the person that what they are probably thinking of are insecticides, particularly such groups of chemicals as pyrethroids or neonicotinoids, several of which can, if sprayed directly on the bees, prove lethal to them. Much research has also been conducted on sub-lethal levels of neonicotinoids on bee health, and although much of the time the effects in the field are small or non-existent (like in the whole of Australia, where CCD or higher bee losses have not been observed), in some cases small adverse effects are found. There are many larger concerns – like mites and disease – when it comes to pollinators, however. I wrote about this topic more in If You Care About Bees, Look Past Neonicotionoids, and about a recent large study here: New Study Finds Neonicotinoids May Have Harmful, Beneficial, or No Effects on Bees. While many insecticides can indeed harm a variety of insects (though bees are not their intended target), the big difference, as I said earlier, is that glyphosate is not an insecticide, but a herbicide. (Both insecticides and herbicides, among many other -cides, by the way, fall under the umbrella of pesticides). Glyphosate’s particular target enzyme does not exist in animals, which means that it does not interfere with our amino acid synthesis, and has generally very low toxicity outside of plants (or some bacteria). …at dose rates that reflect worst-case exposure scenarios. There were no significant effects from glyphosate observed in brood survival, development, and mean pupal weight. Additionally, there were no biologically significant levels of adult mortality observed in any glyphosate treatment group. 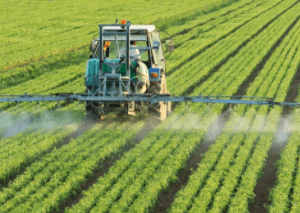 Using a modified spray tower to simulate field spray conditions, the researchers found that 26 pesticides, including many (but not all) neonicotinoids, organophosphates, and pyrethroids killed nearly all of the bees that came into contact with the test pesticide sprays. However, seven pesticides, including glyphosate and one neonicotinoid (acetamiprid), killed practically no bees in the tests. Well, that seems rather straightforward. Glyphosate shouldn’t really be a problem for bees, there is no suggested mechanism of harm in bees, and… it does not show ill effects in bees. 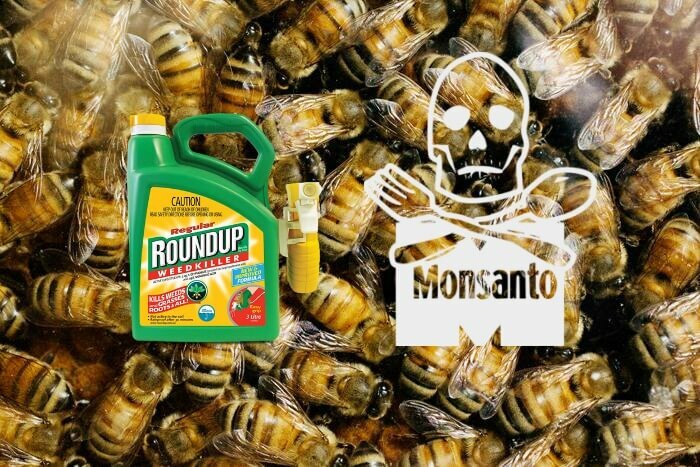 But wait – groups like GMO-free USA actively peddle the idea that glyphosate would be ‘contributing to colony collapse disorder’ (see meme below). How, then? This particular work on bee behaviour comes from one lab in Buenos Aires headed by Dr Walter Farina, where they have published three papers that claim glyphosate impairs bee learning in some ways. The study of bee cognition is certainly a fascinating area. 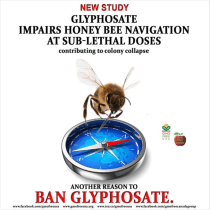 The group’s 2015 paper on bee navigation found that bees fed with a sucrose solution with 10 mg/l of glyphosate took a longer time to fly home. Let’s take a look at their experiment. They trained bees to collect sucrose solution at a feeder. They then captured them at the hive, tagged them and glued a radar transponder on them, fed them sucrose with or without glyphosate, released them at a new location, and recorded their flight back to the hive (or feeder). They then tried to catch the same bees again at the feeder after that, to drop them again at the same release location and see if they had learned something about finding their way home. They had the bees divided into four treatment groups, and had between 8 and 22 bees in each group the first time around. During their first release, they found that the high treatment group (8 bees strong) took on average about 9 minutes to fly back (see figure A), while all the other 42 bees of the other 3 groups (control, 2.5, and 5 mg/l treatment) flew home on average in about 4-5 minutes (one outlier in the control and largest group, with 22 bees, took the longest, 17 minutes, but they also had the fastest home-run, about 2 minutes). After this they tried to re-captured the bees, but only managed to get hold of four bees in the high treatment group. All four re-released groups flew back home at very similar times, between 3-11 minutes, which by the way is a range where the first high treatment flight-time falls in too (see A in the next figure below – why they have the scale so zoomed out this time, so that comparison to the first figure A is not as clear, I don’t know). The range was similar between releases, with no clear learning effect for any group. The flight times to the feeder were similar too, apart from the high treatment group, which was actually faster. Of course, at this point each flight-group studied had between 1-4 or 1-12 bees (…), and so nothing was statistically significant. Let that sink in. Yes, the paper claims to analyze ‘long-term consequences’ for bee learning – based on two flights, and with experiment ‘groups’ that are 1 bee strong. With that type of experiment, you really need large numbers of insects and many replicate flight experiments. With only two replicate experiments, this would be a hard sell in an entomology journal, especially given the low numbers used in each experiment. He went on to contrast this study with examples of robust studies instead: like one on bee foraging with three replicates of RFID-tagged bees – in each colony, they included 400 bees per treatment condition (vs the 10-20 in Farina’s); or an earlier study of bee flight of more than two thousand bees all in all, and with four replicate experiments. When you study something this subtle, with bees flying this way or that at 15-minute intervals, the situation is chock full of surprising and unaccounted variables – weather conditions? Other animals? Variations in the manual handling of the bees? What about parasites and disease? The nosema fungus, for instance, is specifically known to cause learning deficits in honeybees, and the Deformed Wing Virus has deleterious effects on foraging. The Mad Virologist has touched before on the shortcomings of bee-studies that make the mistake of not accounting for the variable of bee diseases. To say anything about the real world, of course, this kind of research should preferably be presented with a connection to the overall wellbeing of the hives, following the pattern of actual glyphosate residues in the bees’ environment. Otherwise all this is very hypothetical. Consider that GMO-free USA claim once more: ‘glyphosate impairs bee navigation and contributes to colony collapse disorder’. Wait, what? Eight bees were a few minutes tardier once – though their high-treatment buddies who flew straight to the feeder instead were not tardy. The second time around (the ‘learning effects’) they all flew back home just as fast, and to the feeder even faster than the other(s). The paper also lists number of bees that did not return to the hive, period. In total 26 % of the bees never arrived back at the hive. That seems a rather alarming percentage. If at any one random time when four bees set out from a hive, only three return, it sounds like an untenable situation in the long run. Nowhere in their paper could I find discussion about what might have caused the large rate of non-arrivals. 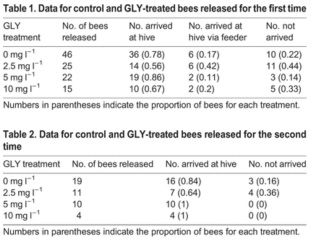 The largest numbers of non-returning bees both times were found in the lowest treatment group, but the control group was no means well off, with 22 % and 16 % losses. In the second release, (the very small) intermediate and high treatment groups actually had zero losses. Should we draw the conclusion that high dose glyphosate has a protective effect then, guaranteeing that bees return to the hive? is far from well supported by the evidence presented. What this analysis hopefully shows, is that the more subtle the thing we are studying is, the more care we should take before drawing conclusions about its implications one way or another. With such tiny groups of bees and no other lab independently supporting these results, to think that this highly variable data shows anything with real-world meaning is incredibly far-fetched. However, no effect on foraging-related behaviour was found. What about the realism of the dosing of the bees by Farina’s group? Several studies report that glyphosate residues in the soil quite quickly decrease to micro and nanogram levels (vs the milligram level dosages in Farina’s studies), and a very rapid breakdown is seen in pollen and nectar. The maximum residue limit in the US on most flowering crops, is also very low, often from a few milligrams to micrograms per kg – and these are the maximum limits, with 99.8 % of all produce tested below, and 80% tested 20 or even more times below – more about the residue data here by Steve Savage. The dosing of bees is made unlikelier again by the fact that glyphosate is commonly applied on weeds as they emerge, to eliminate them long before they can use up resources, flower, and go to seed. 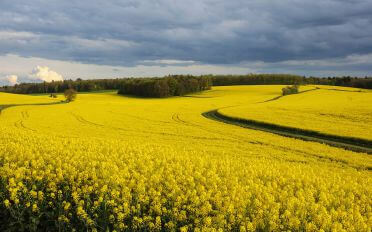 Later as the crop grows its shadowing effect will take care of most other weeds. 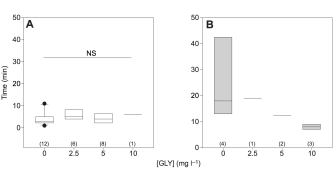 It seems unrealistic that bees would commonly be exposed to concentrations of 10 mg/l in their feed. If that happened at some point, and we would take Farina’s groups’ suggestions at a face value, what might we expect? That the bees would fly home a few minutes later that time? This is very little to go on. In fact, in the 2014 toxicity study from England which looked at twenty hives with more than 10,000 bees each, they directly sprayed the bees’ forage and fed the brood with more than hundred-fold exposure to glyphosate (high treatments being 150 and 300 mg/l), and reported no ill effects on development. Exposure to an order of magnitude higher doses of glyphosate than in Farina’s experiment had no effect on bee health or survival. I have not even seen correlations suggesting a connection between glyphosate use and pollinator health, either temporally or geographically. This seems like a crucial link to present before we start talking about glyphosate actually having anything to do with bees. 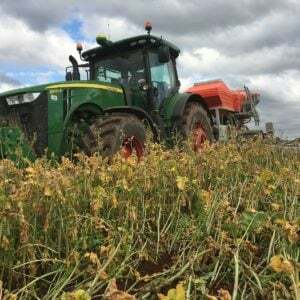 If we truly want to encourage crop diversity, then glyphosate use can be a powerful tool in allowing those diverse crop rotations while still managing weeds. Frankly, glyphosate wasn’t brought into the public discussion because of a sincere concern for bees (although many who end up repeating the claims may do this without realizing the dishonesty). 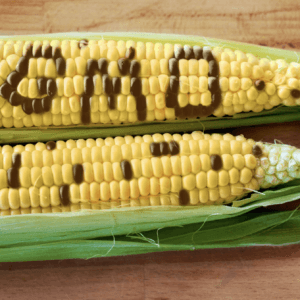 Anti-GMO groups are campaigning against glyphosate because they will grasp any straws to use as arguments against Genetically Engineered crops. They don’t wait for solid support before making claims, either, because it is enough for them to be loud enough and sow doubt in the public perception (an example of the kind of striking anti-glyphosate bias among the French media here, or in French, here). This is an ideological and an emotional type of resistance, where evidence means little, unless it can be used to bolster one’s pre-existing passionate dislike of the idea of biotech crops and pesticides to begin with. Bumblebees I photographed in Finland. Diminishing wildflower habitats and invasive species can pose grave problems for wild bees, whose situation is largely unknown. In many parts of the world, the farmed European honeybee is an invasive species, which especially if left untreated can spread disease. If we care about bees, however, let’s remember the underlining principles about weighing scientific evidence – that we should rely on several converging lines of solid evidence to make sure we are not fooling ourselves – and try to focus on the big picture. Iida Ruishalme is a writer and a science communicator who holds a M.Sc. in Biology from Sweden. Follow her on twitter @Thoughtscapism or on the Thoughtscapism Facebook page. 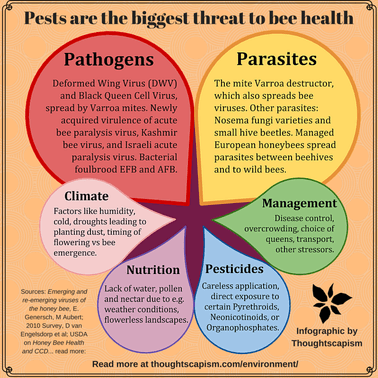 This article was originally published at Thoughtscapism as “No, Glyphosate Is Not a Threat to Bees” and has been republished here with permission.